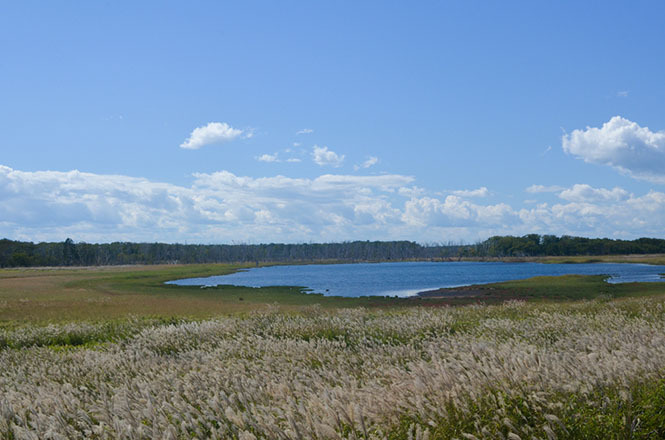 Notsuke Peninsula (野付半島) is a prawn-shaped peninsula across Bekkai town and Shibetsu town in the northwestern part of Nemuro city, and is popular for a scenery like the end of the world. 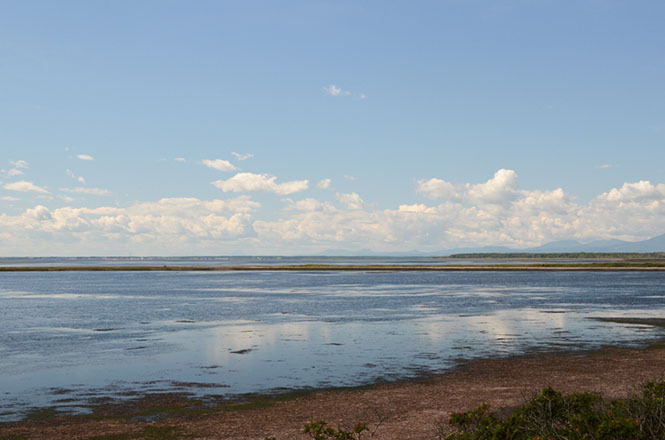 The ground is sand, and a sandbar with 26 km in length is the largest sandbar in Japan. Notsuke means "The lower jaw" in Ainu language. 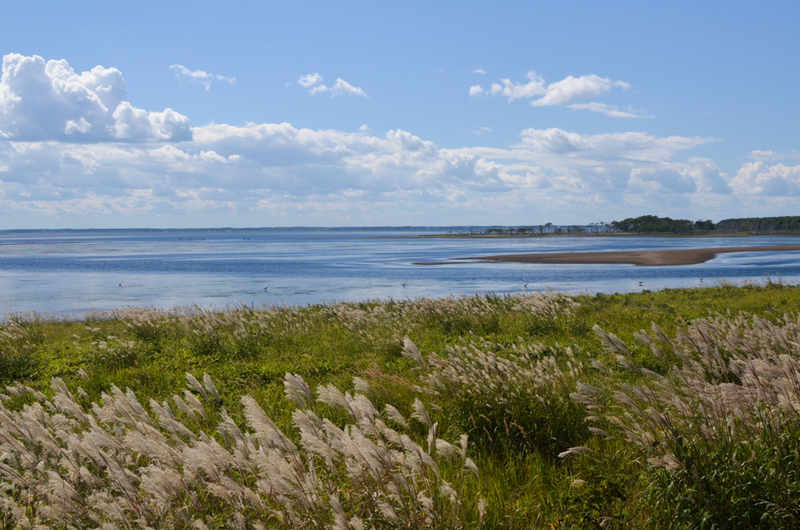 The peninsula was named after its shape from top like the lower jaw of whale. 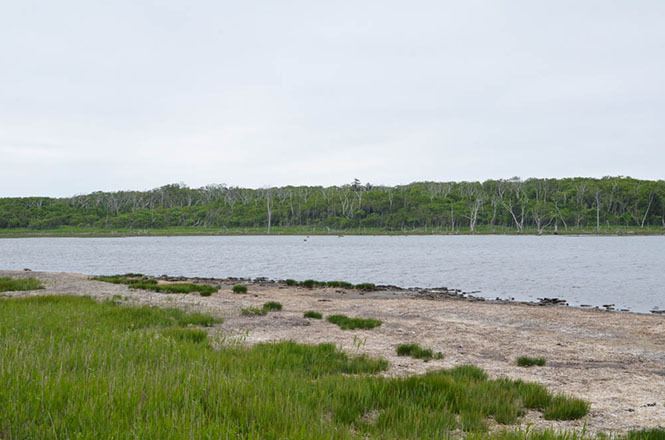 I do not know whether it is an ancient legend of Ainu people, but it is said that a large dead whale drifted to here, and its lower jaw turned into this ground form. Maybe here has been the end of the world since that age because the dead body drifted to here. 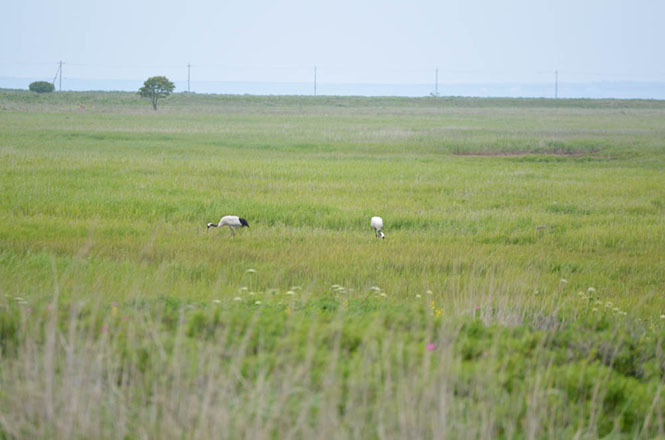 The Gulf of the Notsuke, the inside of the Notsuke Peninsula, and Odaito (尾岱沼) have been designed as the Ramsar Convention wetland since 2005. 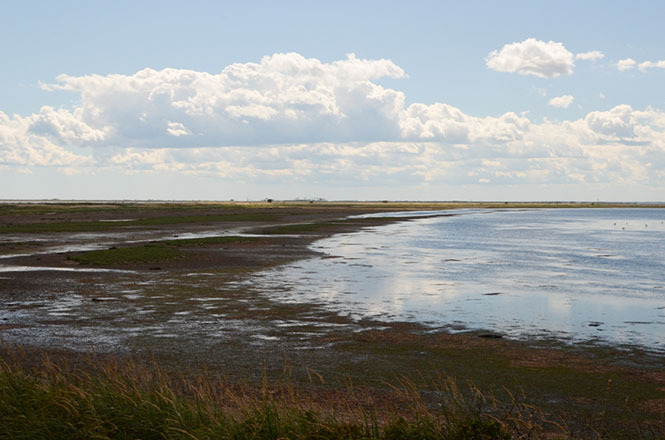 Here is a paradise of about 250 types of wild birds such as White-Tailed Eagle, Steller's Sea Eagle and Whooper Swan. A tourist map of Betsukai Town Holidays. 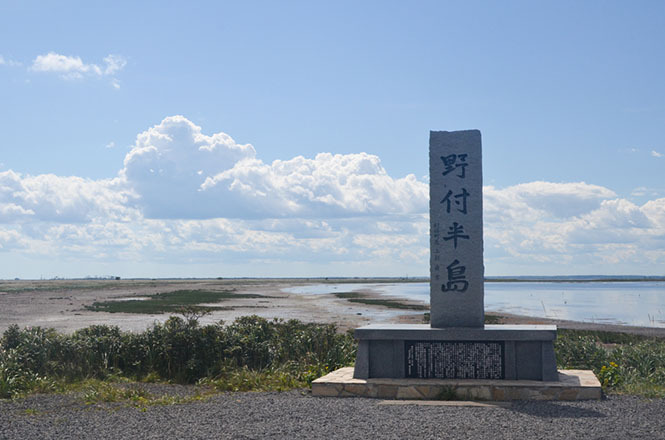 Speaking of the Notsuke Peninsula, Todowara (トドワラ) is the most famous tourist attraction. Unfortunately, most Todowara has disappeared at present. 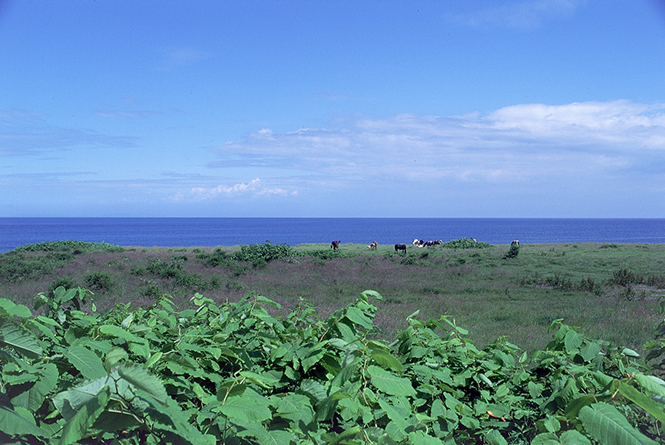 But a typical scenery of the Notsuke Peninsula can be seen because Narawara (ナラワラ) is still left. A sightseeing ship provides a ferrying service between the Notsuke Peninsula and the Odaito, Betsukai town (別海町尾岱沼), and the tourists can look over Notsuke Peninsula and Odaito on the sea. An unusual scenery with flowers and the sea on both sides across Hokkaido Road 950 called Flower Road (フラワーロード) can be seen. The narrowest point near Notsuke Peninsula Nature Center is about 60 m, and it looks like a road on the sea. 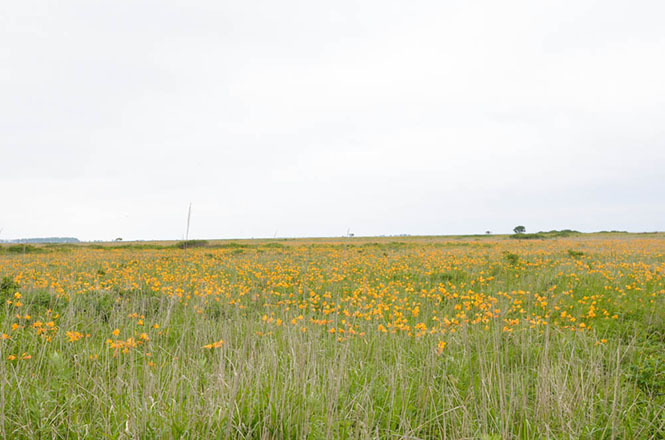 The road is called "The Flower Road" so much that a lot of flowers bloom along the road. About 320 types of nature flowers such as Yezo Daylily, Rugosa Rose and Black Lily bloom sequentially from May to mid October. In a winter, the flower gardens turn into snowfields, and a typical scenery of Hokkaido can be seen, too. Maybe the square-shaped sun is seen if you are lucky. 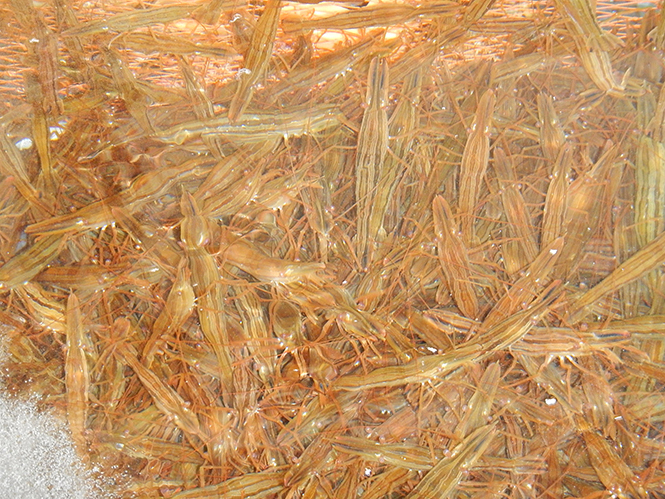 Speaking of the Notsuke Peninsula, Hokkai Shrimp (北海縞海老) is noted product. 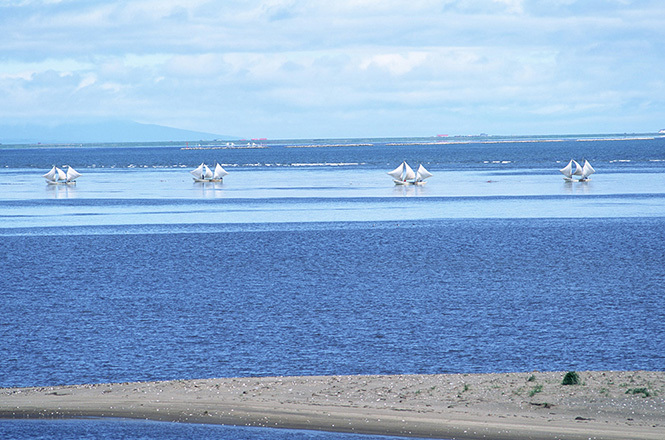 An unique shaped ship called "Utase Ship" is floated on the sea in the Gulf of the Notsuke, and a fishing scene is famous. The Hokkai Shrimp seems to be able to judge the freshness in the state of striped pattern. It is tasty even if the tourists eat a raw shrimp (Sashimi) or a boiled shrimp because the freshness is a good point for a brand. The fishing Hokkai Shrimp is a seasonal event in a summer or an autumn, and Odaito Shrimp Festtival (尾岱沼えびまつり) is held in late June. By the way, specialties in the Bekkai are seafood and milk. 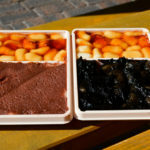 Local dishes are Bekkai Jumbo Scallop Hamburger (別海ジャンボホタテバーガー) and Bekkai Jumbo Sakhalin Surf Clam and Steak (別海ジャンボホッキステーキ丼). 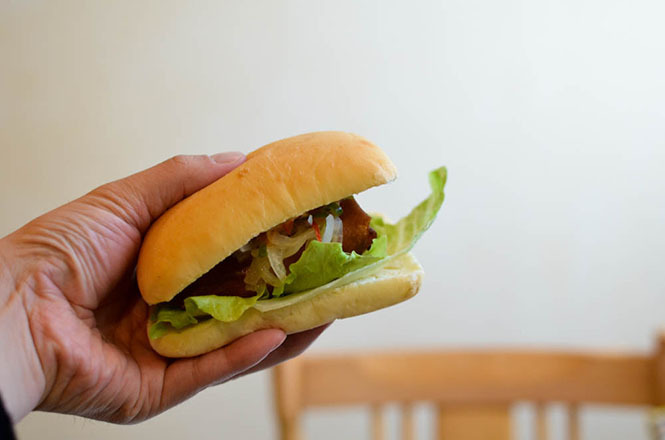 I ate the Bekkai Jumbo Scallop Hamburger at Hamanasu (はまなす), and it was tasty. 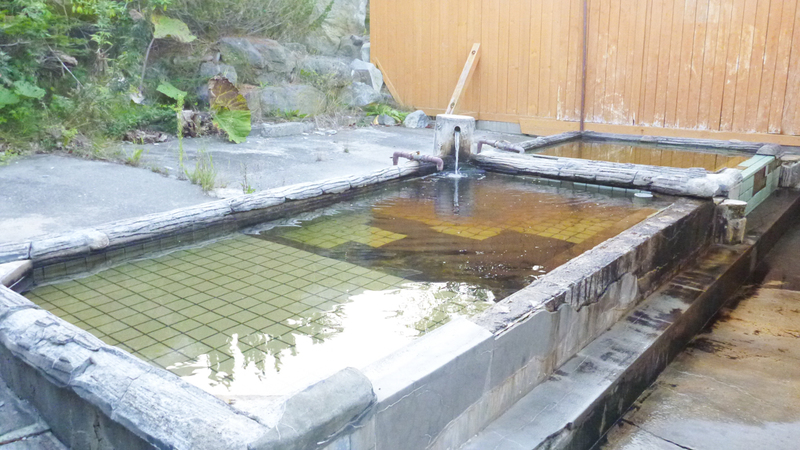 In addition, A day trip onsen is available at Notsuke Onsen (野付温泉) and Odaito Onsen (尾岱沼温泉) in the Odaito located in the opposite of the Notsuke Peninsula. 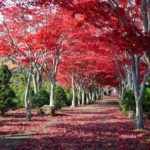 The Flower Road, the Narawara, the Notsuke Peninsula Nature Center, the Todowara and Ryujinzaki Primeval Flower Garden (竜神崎原生花園) are on the Notsuke Peninsula. 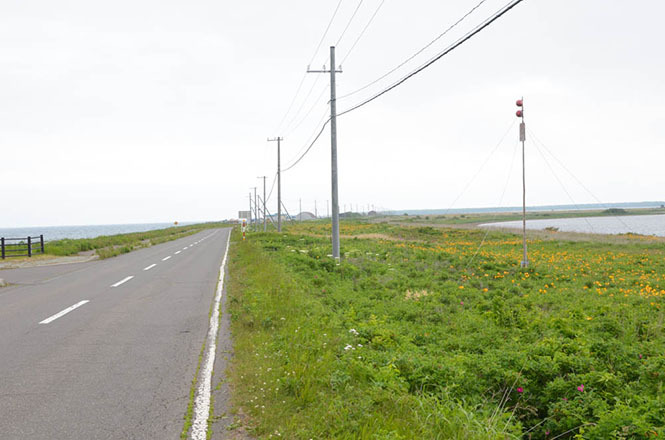 Flower Road is only road of about 15 km in toal length through the Notsuke Peninsula, and was named after about 230 types of nature flowers such as Thermopsis Lupinoides, Yezo Liquorice and Rosa Rugosa that bloom along the road. 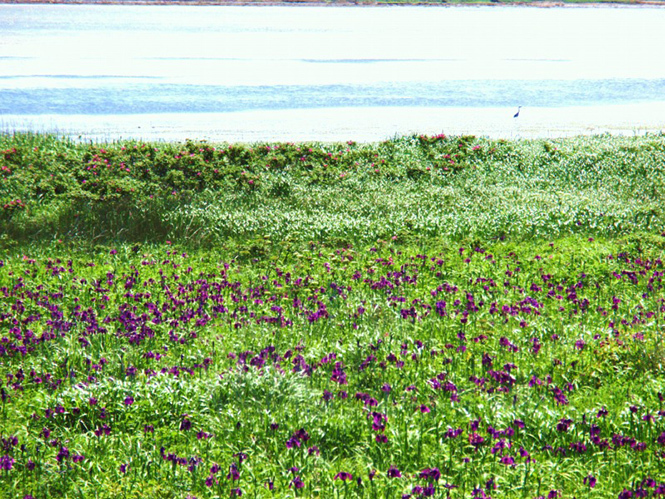 The best time to see the flowers is from mid June to mid August. 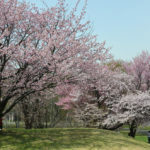 Visitors can park their cars on Tenbochushajo Parking Lot (展望駐車場), and can admire the flowers. Gravestones for feudal retainers of Aizu clan are built along the road, too. Admission free. A parking lot is free of charge. A facility such as a wooden path is not built, and there is like a primeval flower garden. 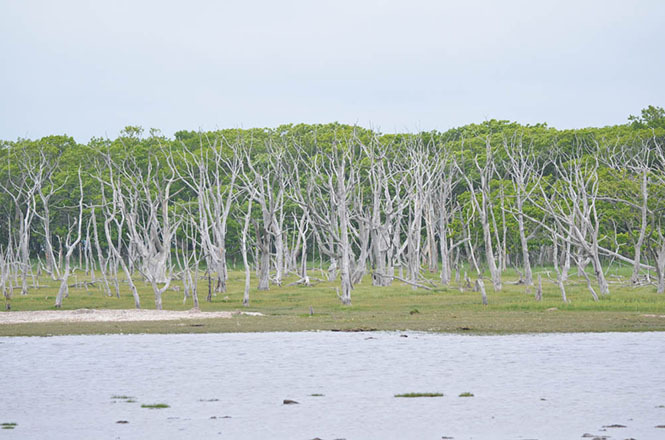 Narawara is a dead Japanese oak forest eroded by seawater, and is stood and decayed. Because it looks mysterious and beautiful, it is popular as a natural scenery. 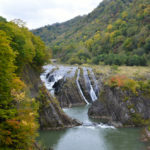 The Todowara is decreasing recently, but the Narawara is still worth seeing. But it may disappear as well as Todowara several decades later. I recomend that you will see it early. Not only in a summer, but also in a winter, the Narawara makes visitors feel the end of the world more and more. A facility is only a parking lot. A wooden path is not built, so the forest can be seen at a distance. Admission free. A parking lot is free of charge. Notsuke Peninsula Nature Center is a sightseeing base of the Notsuke Peninsula, and the Todowara and a boarding point for the sightseeing ship are near here. 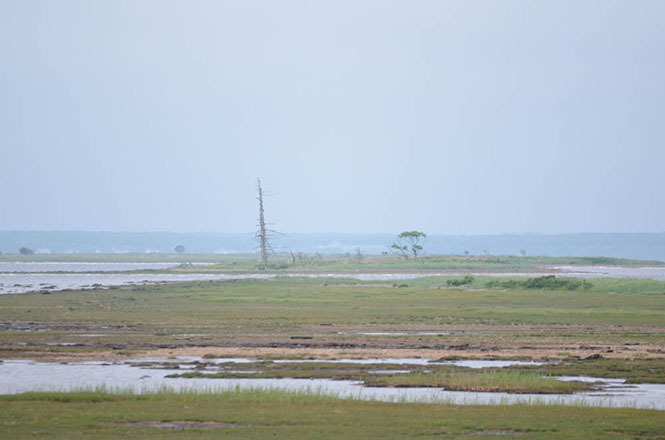 The Todowara is a dead pine forest eroded by seawater, and is stood and decayed, and it has become a synonym for the Notsuke Peninsula. 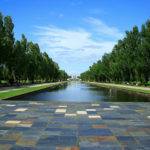 It makes visitors feel the end of the world, and is very popular. 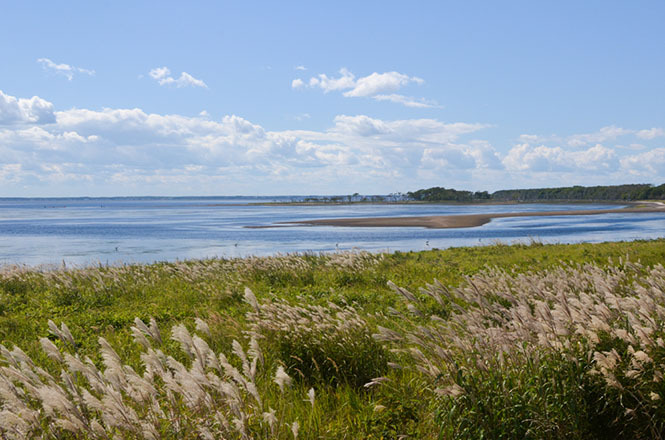 But most Todowara has disappeared at present. It can not go against natural law. 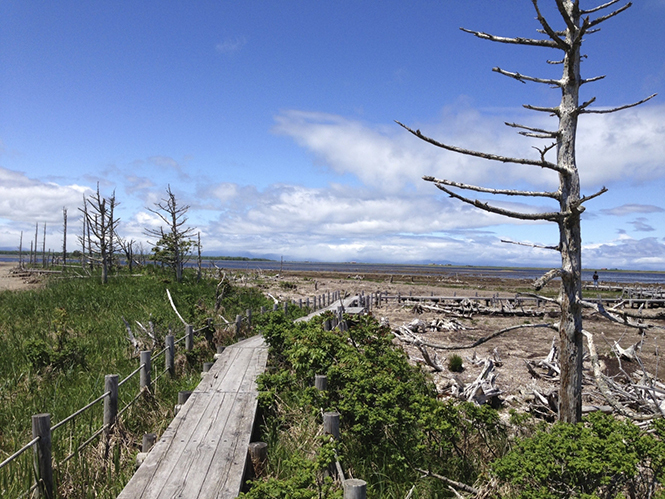 The inside of the Notsuke Peninsula is a tidal flat, and wooden paths of about 1.2 km in total length are built on the shore. 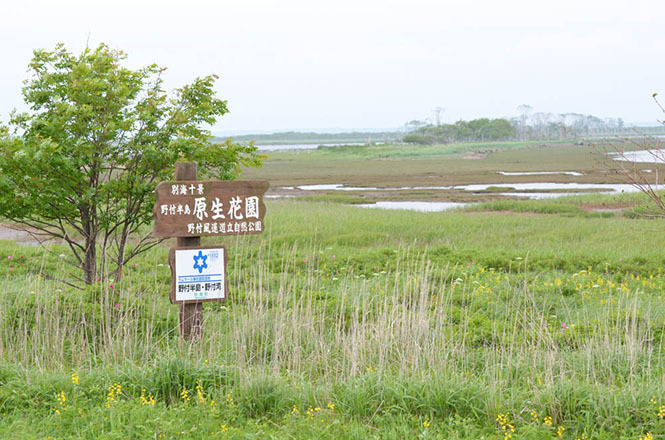 Tourists can take a walk through the wooden paths from the Notsuke Peninsula Nature Center to the boarding point on foot. The time it takes to go one way is about 25 minutes. Except the foot, a tractor bus runs for JPY 500, an one-way ticket. It takes about 7 minutes by bus. 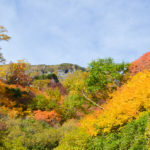 A mystical scenery of the Todowara is used as shooting places for Music Video or the cover art of CD such as "Wadatsumi Tree" sung by Ms. Chitose Hajime (元ちとせ), "I for you" sung by LUNA SEA and "UNITY ROOTS & FAMILY, AWAY" sung by GLAY. 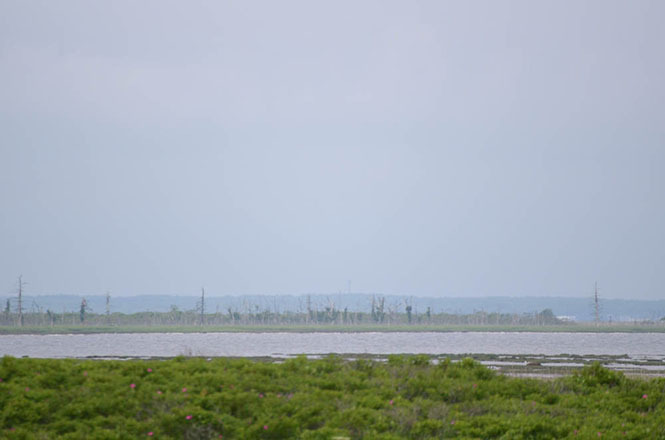 The scenery of the end of the world is popular, after all. 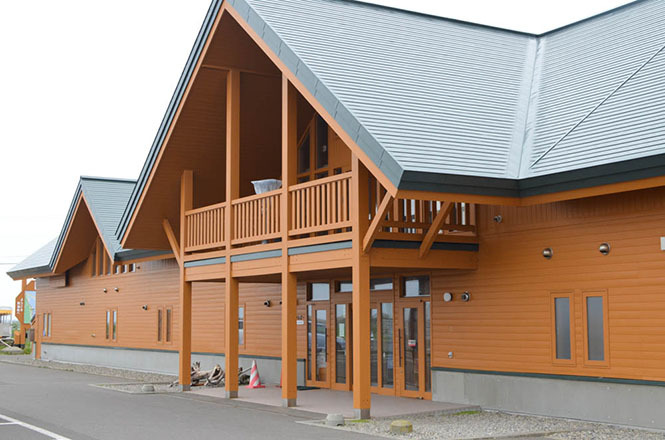 The Notsuke Peninsula Nature Center has a restaurant, a souvenir shop, a restroom, a nature floor. Nature Guide can be requested for JPY 3000 only in Japanese, and it takes about 100 minutes on foot. 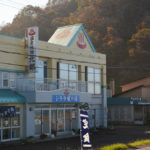 In addition, a local dish "Jumbo Scallop Hamburger (別海ジャンボホタテバーガー)" and the Hokkai Shrimp can be eaten at the restraunt. Admission free. A parking lot is free of charge. 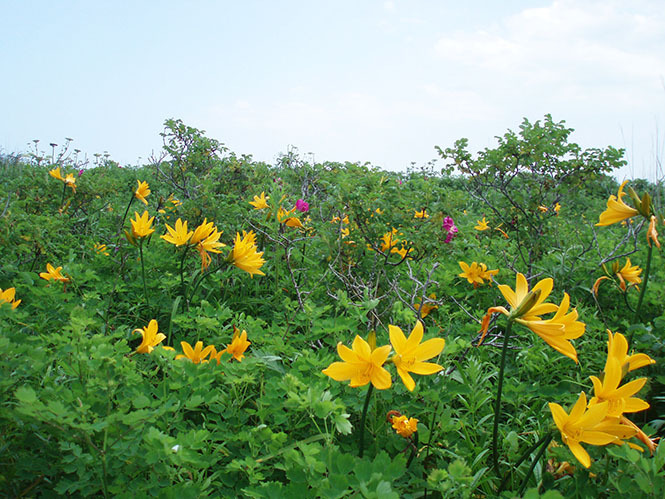 Ryujinzaki Wild Flower Garden (竜神崎原生花園) is in the the most remote end of the Notsuke Peninsula. Notsukezaki Lighthouse (野付崎灯台) is near here, and a restroom is built on a parking lot, too. 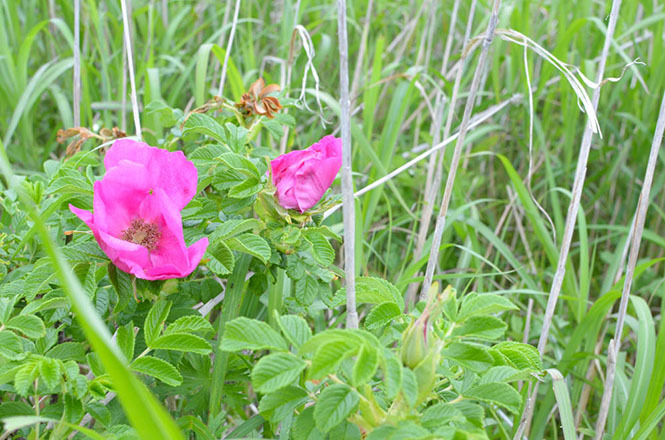 The nature flowers such as the Yezo Daylily, the Rosa Rugosa and the Black Lily bloom sequentially from late May to October. 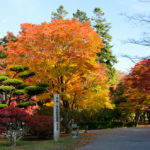 In addition, it is said that Tsukoya remains named the phantom town "Kiraku (キラク)" used to be in the Edo period. A song "Phantom Kiraku (まぼろしのキラク)" sung by Mr Kenji Ninuma (新沼謙治), a Japanese famous enka singer, uses here as a motif. Admission free. A parking lot is free of charge. 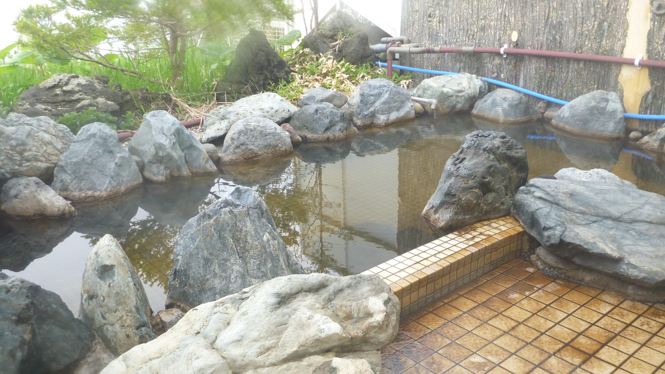 Refer to following websites for the accommodations around Notsuke Peninsula. You can get information regarding online reviews and photos. 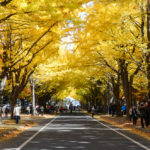 New Chitose Airport (新千歳空港) --> (Approximately 55 minutes by Plane) --> Nemuro-Nakashibetsu Airport (根室中標津空港) --> (Approximately 5 minutes on foot) --> Nemuro-Nakashibetsu Airport bus stop (根室中標津空港停留所) --> (Approximately 6 minutes by Nemuro Kotsu Bus [To Nemuro] (根室交通「根室行き」)) --> Nakashibetsu bus terminal (中標津バスターミナル) --> (Approximately 30 minutes by Akan bus [Kushiro-Rausu Line To Rausu] (阿寒バス「釧路羅臼線：羅臼行き」)) --> Shibetsu bus terminal (標津バスターミナル) --> (Approximately 30 minutes by Akan bus [Otaito Line To Hakuchodai] (阿寒バス「尾岱沼線：白鳥台行き」)) --> Notsuke-hanto Nature Center bus stop (野付半島ネイチャーセンター停留所) *There is a bus service to Notsuke-hanto nature center once a day.